Retrieve event information through formatted reports. 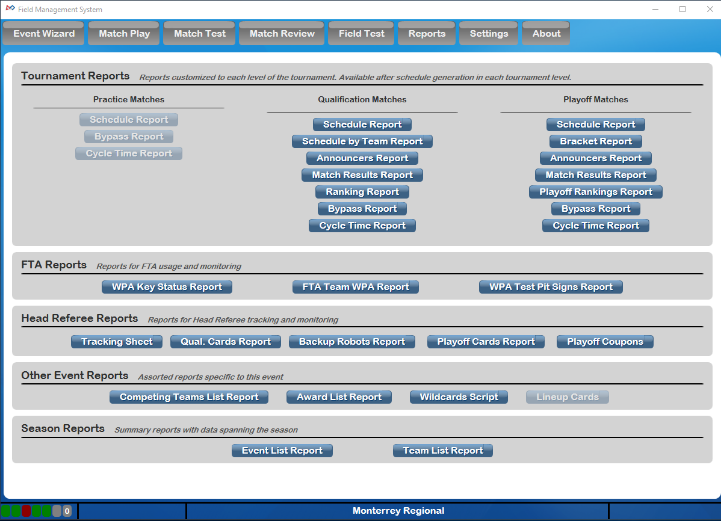 The Reports screen is used to generate printable reports needed throughout the tournament. Once a report has been generated, several options are available to the user. Printing options can be selected as well as a file-export feature. Reports can be exported in Microsoft Excel, Word, or PDF file formats. 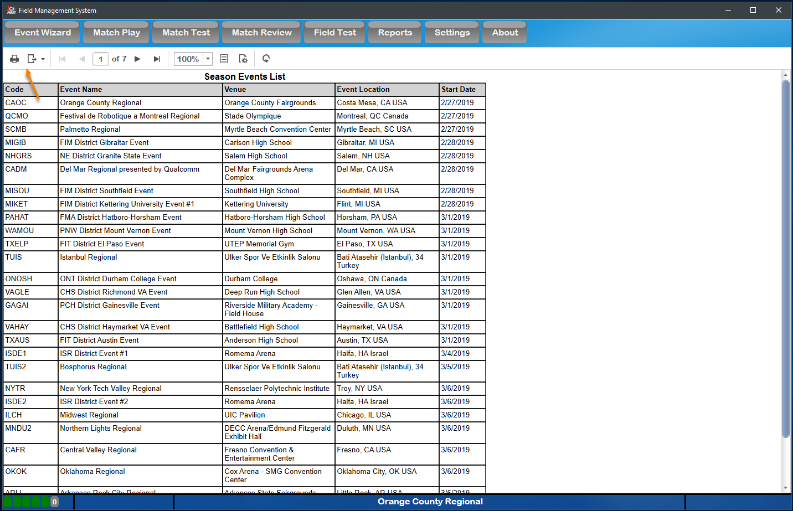 An example report, showing the event list. Report could be formatted (although default formatting should be sufficient) and then printed or saved from this interface using the buttons on the bar indicated above with the orange arrow. FTA Team List WPA: Same as WPA Key Status Report, but with WPA keys shown. Requires FTA password to run. Tracking Sheet: A sheet used by Head Referees for tracking information throughout the event. Head Referee may request a copy from the Scorekeeper. Awards List: A list of the awards to be given out at the event. The winners are included if they have been assigned. Awards Eligibility Report: A report listing all teams attending the event, and their eligibility for certain awards (such as Chairman's Award). To export a report (such as providing an Excel version to a Judge Advisor), first, select the export icon (pink arrow) on the bar above the report name. Second (green arrow) select the file format you wish to export. Selections include Microsoft Excel (Excel), Adobe PDF (PDF) or Microsoft Word (Word). This will (after a short "working" indicator) bring up the standard Windows save dialog (right) where you can select the location to export the report. 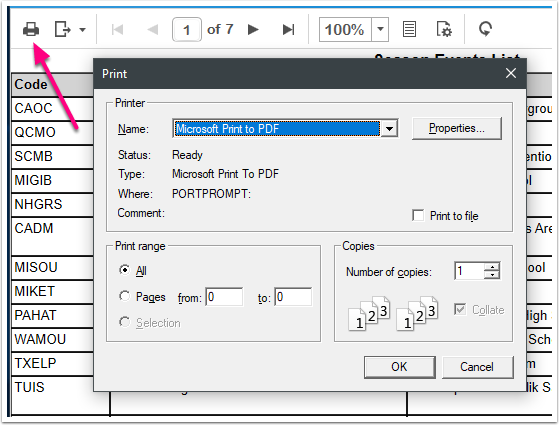 Print reports by selecting the printer icon on the bar above the report name. This will bring up the standard Windows print dialog where the report can be printed.